Native to Argentina. A clumping perennial with saw-toothed, light green, grassy leaves. 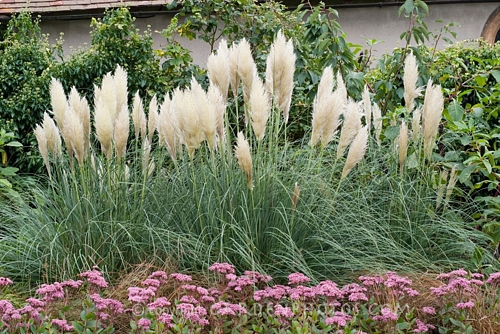 1" to 3' long white plumes rise above foliage in late summer. Very fast growth rate. 'Pumila' is a dwarf variety that only gets about 4' tall and wide, perfect for small landscapes. Wind and drought tolerant. 'Pumila' is perfect for smaller landscapes.